You are reading 11 Copywriting Tips For "Do-It-Yourselfers" Read more from this series of articles. Start every web page and/or blog post with a descriptive title. Headline’s are very important, but that’s not what I mean when I refer to “title.” We’ll cover headlines later in this series. In this context, when I say “title,” I’m referring to a gizmo inside of your WordPress blog where you can input a Title, Page Description and Meta Keywords. 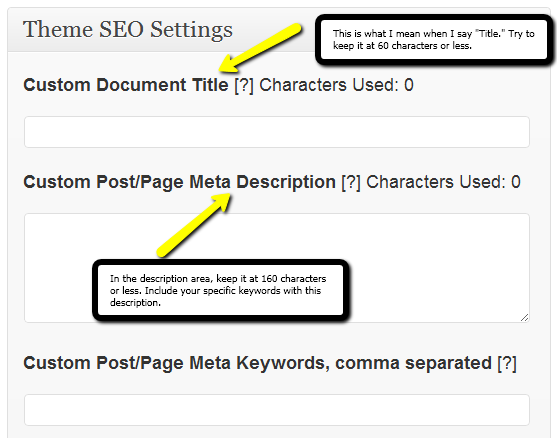 If you’re using WordPress, you should have SEO settings located under where you would be typing up your page or post. Here’s a picture of it so you can see what it looks like (see the picture below). You want to make sure you fill these out completely. The bottom one – meta keywords – doesn’t matter as much, if at all, but the other two do. Although search engines will never buy your products or services, or join your deal, they can drive qualified people to your web and/or blog site. Search engines understand copy. They don’t read logos, head shots, flash or video, but they do read your copy. Write with descriptive page titles that explain succinctly and specifically what the focus of the page or post is. Keep the title description to 60 characters or under. Here’s an example of what I mean by “succinctly and specifically” … Instead of writing “Services” you’d write “Holistic Healing Services in Southwest Michigan.” See the difference? These titles that you create for your pages and posts is often the first thing prospects see on the search results page. Notice that it doesn’t take a copywriting genius to get this right. They’ve written a clear title. This title gives people a compelling reason to click on the link. In the description area, they’ve given a specific and concise about who they are and what they do. They even ended with a call to action, and included a phone number. Okay, today you’ve learned the importance and relative simplicity of completing your title and description fields inside of your WordPress blog. If you haven’t been doing this, start doing so. Go back to old posts and be sure you’re happy with what you’ve written. Get The Renegade Blog delivered to your inbox whenever a new post is published. Great basic tips for any beginner to use. Thanks for sharing them! I would say that if you really write for people, the search engine stuff is fairly automatic – but going back after you have finished your piece and making sure that the basic SEO elements are there is a good practice to get into. Great stuff! Hey Eric, thanks for the helpful tips. Having a description that would compel a person to click over to your site is crucial.